Great location for first floor spacious Townhome in the Countryside area. Nice area, lots of landscaping with assigned parking. 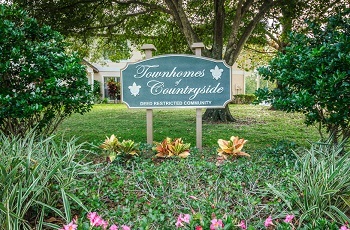 The properties for sale in the community Townhomes of Countryside are perfect for homebuyers seeking a modestly sized, quality place to live that won't break your budget. The units here are primarily 2/2s or 2/1s with some exceptions, and have anywhere from 800 sqft up to 1500 sq ft. This is a pet friendly neighborhood with a community pool, so it makes it a great choice for a family! The community is situated on the eastern side of Palm Harbor, FL. so you get the best of both worlds: easy access to everything Pinellas County has to offer (Clearwater Beach, Honeymoon Island, St. Pete) while still being in close proximity to Tampa International Airport, Tampa's international mall, and many other places to shop, eat and find entertainment. The Townhomes of Countryside are a great spot to choose for both a first timer or an experienced home buyer. Call us today so we can help make this a reality for you! Selling your home in Townhomes of Countryside? If you are planning on selling your property in Townhomes of Countryside or elsewhere, recruit us for the job! We have a team of devoted, highly experienced agents who will stop at nothing to get your home sold fast. We'd be delighted to add you to our list of satisfied customers.